Dividend of 6.15% for 2012 is the highest since 2000. The last time it was more than 6% was in 1999 (6.84%) and highest dividends saw EPF distributing 8.5% to members every year from 1983 to 1986. Starting Feb 18, 2013, members can get a statement of their accounts showing the credited dividends at EPF kiosks, counters or through i-Account while those aged 55 years and above can also withdraw the dividends. 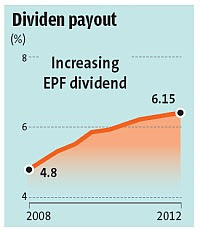 KUALA LUMPUR (Feb 17, 2013): The Employees Provident Fund (EPF) has declared a dividend of 6.15 per cent for the financial year ending Dec 31, 2012, the strongest results in early millennium. Its chairman, Tan Sri Samsudin Osman said the rate was 15 basis point higher than six per cent paid in 2011. "It is also a new record for RM27.45 billion will be disbursed to EPF members, up 12.20 per cent from RM24.47 billion distributed the previous year. "EPF also recorded the highest gross investment income of RM31.02 billion in 2012, an increase of 13.91 percent compared to 2011," he said in a statement. He said despite increasingly complex investment environment, the EPF maintained a steady upward momentum to record the strongest results since the early millennium, supported by effectiveness of long-term investment strategy, and disciplined and prudent approaches. In addition, he said in line with the Strategic Asset Allocation practised by the EPF, most of its asset investments continued to be confined to low-risk fixed-income and stable instruments. He said equity investment made up 38.77 per cent of the total asset investment in 2012 while the remaining 3.59 per cent and 2.42 per cent respectively were in money market instruments, and real estate and infrastructure. 6.15% looks good, but it looks not much in RM after some calculations. Keep up the good work EPF. Seems like window dressing, but it's definitely a good one. semua perlukan wang baik nak bina rumah, pendidikan, mulakan pernigaan dan sbgnya klu tka der duit susuh nak hdup.